Bradley Cook (left) shares a warm handshake with Snow College President Gary Carlston after Cook is selected as the 17th college president. EPHRAIM—A former Badger quarterback will be returning to Snow College in May, but this time he will lead more than the football team. Following a lengthy closed session last Friday, Jan. 11, the Utah State Board of Regents selected Bradley J. Cook, a Snow College alumnus who is presently provost at Southern Utah University, to succeed Gary Carlston as the 17th Snow College president. “I am so honored to have been selected for this position in this amazing, incredible place that gave me a start, that believed in me,” Cook said after the announcement. “President Cook first arrived at Snow’s campus as a freshman a number of years ago. 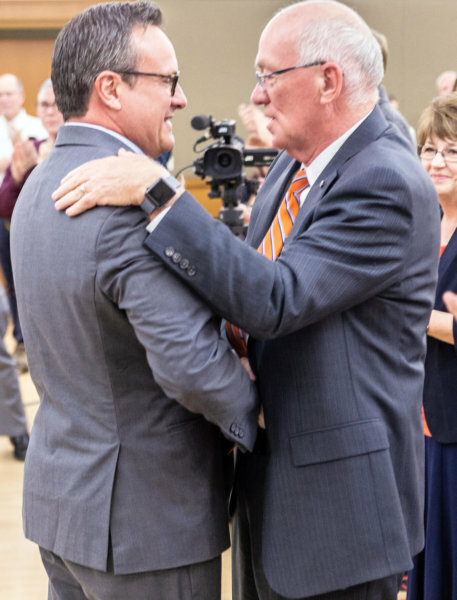 Now Snow College will greatly benefit from his significant experience in higher education and strong commitment to student success,” said Dave Buhler, Utah commissioner of higher education. 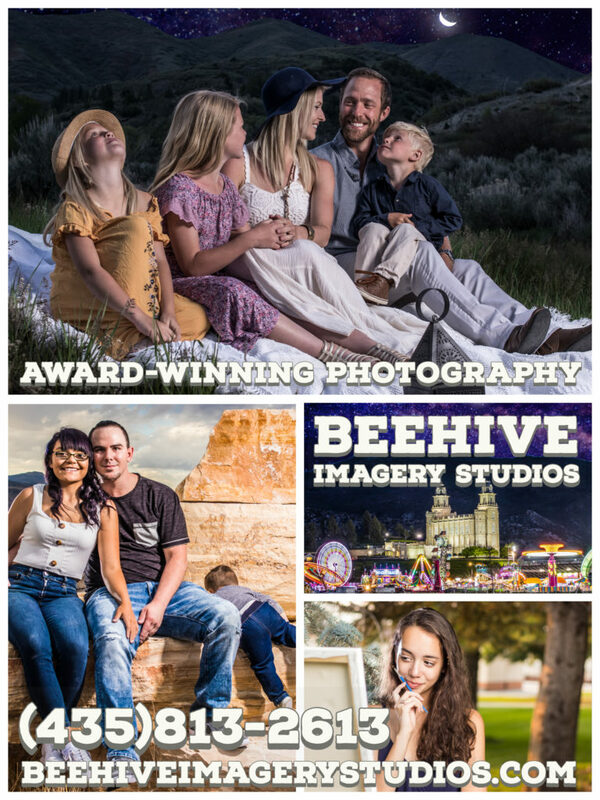 During Cook’s time as provost, SUU has created more than 25 new academic programs and centers. Before his time at SUU, Cook was president of the Abu Dhabi Women’s College in the United Arab Emirates. He also spent eight years as vice president of college relations and later as vice president of academic affairs at what was then known as Utah Valley State College. Cook has bachelor’s and master’s degrees from Stanford University and a doctorate from the University of Oxford. Cook shook hands and waved to an enthusiastic group of applauding attendees as he made his way to the podium following announcement of his selection. Cook emphasized that he wanted to look to the future and work hard to create opportunity for the school and its students. 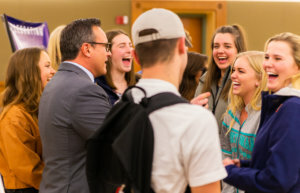 Bradley Cook, currently provost at Southern Utah University, is surrounded by Snow College students after the announcement of his selection as the next college president. Cook was picked from four finalists, each of whom held an administrative position on in one of Utah’s state institutions. A 22-member search committee, which included regents, Snow College trustees and community leaders spent months gathering feedback on the qualities of the next president, writing a job description, advertising for candidates and conducting interviews before narrowing down to the finalists. An open question-and-answer session during which each finalist answered questions from students, faculty and the public, was held Thursday, Jan. 10, in advance of the Friday meeting where the final selection was made. Cook began his presentation at the public session by recounting the story of his great-great-grandfather, George Washington Bradley, who, with Isaac Morley, led the first group of Mormon pioneers to Manti in 1849. “I grew up with stories of the grit and persistence of these pioneers,” he said. He grew up in Central Valley, Sevier County. At the time, he said, the only indoor swimming pool in the region was at Snow College in Ephraim. When he got to go to Ephraim to swim, “I thought it was Disneyland,” he said. 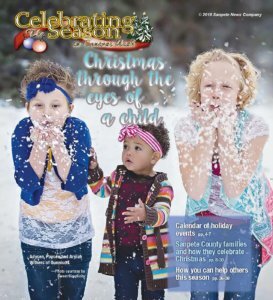 There has been considerable discussion recently about the fact that after several years of growth, Snow College enrollment has leveled off. At the same time, he said, “there needs to be a sense of positive restlessness” in which college faculty and staff are constantly examining what they are doing and trying to do better.